Nathan Miller (Will Arnett) is a rising news journalist who just so happens to have just ended his marriage and is adjusting to the single life, but he won't have a whole lot of adjusting to do when a new lady moves in with him. 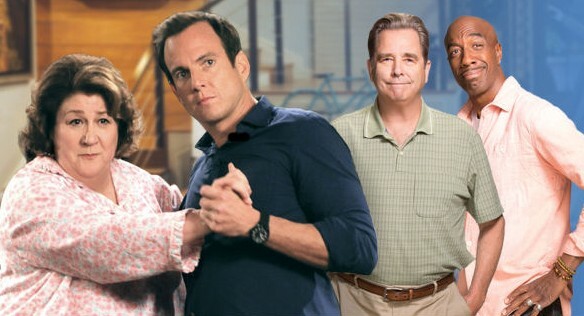 Unfortunately, that new lady is his mother, Carol (Margo Martindale), and she is being forced to adjust to a new life too as Nathan's divorce makes his father, Tom (Beau Bridges) realize that leaving his wife could actually be fun. In the CBS sitcom The Millers, it is all about getting along and making the best of the situation. Will Arnett (Nathan Miller) is a Canadian born comedian who is best known for his work in sitcoms including Arrested Development, 30 Rock, Running Wilde, and most recently Up All Night. He has also had many roles in films, including RV, Blades of Glory, and Semi-Pro. Beau Bridges (Tom Miller) is a well-known American actor who was born into show-business as the son of legendary actor Lloyd Bridges. Beau Bridges, in fact, had his first acting role at the age of seven in an uncredited role in the form Force of Evil, and made his sitcom debut in 1960 in the sitcom My Three Sons. In more recent years, he has appeared in series including The Agency, Stargate SG-1, and My Name is Earl, along with guest starring roles among several series. Margo Martindale (Carol Miller) is an American film, stage, and television actress best known for her supporting roles in films including The Hours, Million Dollar Baby, and Lorenzo's Oil. Making her debut in 1980s at the Actors Theater of Louisville, she went on to supporting roles in movies as well as roles in TV series, including The Riches, Justified, Mercy, and A Gifted Man. J.B. Smoove (Ray) is a stand-up comedian who got his start on Def Comedy Jam. He has had roles in series including Curb Your Enthusiasm, Til Death and Everybody Hates Chris. He has also appeared in films including Date Night, Mr. Deeds, and The Dictator. Jayma Mays (Debbie) made her debut in the series Joey, and since then, she has most notably appeared in the role of Emma Pillsbury in the series Glee. Other credits include multiple episodes of Heroes and Ugly Betty. Nelson Franklin (Adam) is perhaps best known for his short stint on The Office as Nick, the "graphic design guy," but he previously starred in the short-lived Fox series Traffic Light (which, coincidentally, served as a replacement for Will Arnett's Running Wilde). More recently, he has appeared in a few episodes of the Fox series New Girl. Eve Moon (Mikayla) is a child actress who makes her TV series debut in this series. She has previously had a career in commercials, appearing in spots for products including Kraft Cheese, Eggo Waffles, and Humana. In the pilot, we meet Nathan Miller (Will Arnett), a rising news journalist who just went through a divorce. Everybody is aware of the divorce, except his own parents, the constantly befuddled father Tom (Beau Bridges) and overbearing mother Carol (Margo Martindale). As it turns out, a mishap at Tom and Carol's home (thanks to Tom) leaves their basement flooded, and they're about to head in to town to stay with Nathan's sister Debbie (Jayma Mays) and her husband Adam (Nelson Franklin). Things do not go quite as planned, however. Upon arriving in town, Carol quickly gets into an argument with Debbie over some home-decorating disagreements and Tom and Carol end up at Nathan's home, which forces him to reveal the reason why his wife isn't there. Unfortunately for Carol, the news of this divorce gives Tom the idea that maybe it is time for him to let go of his wife as well, which lands him in the home of Debbie and Adam, while Nathan is stuck with his mother... with no end in sight. Once again, CBS has given us another sitcom with proven stars (particularly Will Arnett and Beau Bridges) with a sitcom veteran (Greg Garcia) behind it. However, unlike a lot of the other sitcoms out there that we have seen filled with stars this season, this one is pretty decent, although maybe a bit short on laughs (at least so far). The pilot was enjoyable to watch, and had a plot that gave a good introduction to the characters and the background without being too boring. There weren't a whole lot of laugh out loud funny moments in the pilot, although there was one great moment at the end where Nathan is having a party while his mother is upstairs sleeping... or at least until she comes down in her night gown. Reminding him of his wedding, where she insisted that he do some "dirty dancing" with his bride to the song "(I've Had) The Time Of My Life," she believes that his party would be "livened up" a bit if he relives that moment in his own living room. Nathan, being the good son that he is, lets her have that moment, and it certainly gets a little weird. One thing that I'm not so sure about with this series is the casting of J.B. Smoove in the role of Ray, Nathan's coworker and friend who seems to always be there for... everything. I feel that the producers probably do have something in mind for his role to make him a character with more dimension on the series, but from what I saw in the pilot, he just seemed to be there to comment on anything and everything, with no real reason for always being there (in other words, I feel that it needs to be explained a bit better why he is part of Nathan's home life and personal life) and with no real problems that he is dealing with on his own. It remains to be seen if they can expand his character and explain why he is around as often as he does. This isn't a bad show, and I could see it having some room for growth without making a whole lot of changes. It seems to be a good fit for the CBS lineup of sitcoms and is very much similar to the style of sitcom that we see there. While it could use a few tweaks here and there, it is still a sitcom that is decent to watch and very much workable. It also helps that it is airing right after The Big Bang Theory, as that series is about the best lead-in that a sitcom could possible have. I think, though, that having the bigger name stars could work against it. Having those bigger names, even if they aren't all that huge, means that the show really does have a higher standard to be successful, because better known actors can't afford to stick around in a series if anything better comes along. I'm hopeful that this series can survive, and I'm hopeful that we'll see a lot of good things come from it. This is certainly a show that sitcom fans should take a look into. Discuss the show after you watch it on Thursday, October 3 30, 2013 at 8:30PM ET/PT on our message board. Welcome to the Family is a new family comedy that explores the cultural clash when Junior, the son of a Latino family, and Molly, from a Caucasian family, begin dating. The plot thickens when Molly discovers that she is pregnant and Junior asks for her hand in marriage. The series follows both families dealing with their differences as they are forced to join together as a blended family. Mike O'Malley (Dan Yoder) is well-known for his television work, particularly his leading role on Yes, Dear and his recurring role on My Name is Earl. He can also currently be seen in a recurring role on Glee as Kurt Hummel's father. He has also guest starred on popular shows such as Justified, Parenthood, and Parks and Recreation. Mary McCormack (Caroline Yoder) is perhaps best known for her time spent as Kate Harper on The West Wing. She also starred as Mary Shannon on the series In Plain Sight. She has also appeared in a handful of films, including Miracle on 34th Street, Dickie Roberts: Former Child Star, and Full Frontal. Ricardo Chavira (Miguel Hernandez) is best known for his role on Desperate Housewives as Carlos Solis, playing Eva Longoria's husband. He also has a long list of guest roles on shows such as George Lopez, 24, Six Feet Under, JAG, and NYPD Blue. Justina Machado (Lisette Hernandez) is known for her role as Vanessa on Six Feet Under. She also starred as Sunny in the short-lived drama series Missing. Recently, she had a recurring role on Private Practice. She has guest starred in a long list of shows, including Ugly Betty, Cold Case, Grey's Anatomy, Desperate Housewives, and Body of Proof. Ella Rae Peck (Molly Yoder) has guest starred in several shows, including Without a Trace, Law & Order, The Good Wife, and Gossip Girl. Her first starring role came this past winter on NBC's Deception. Joey Haro (Junior Hernandez) is best known for his recurring roles on Awkward and Glee. Welcome to the Family is his first starring role in a series. Fabrizio Guido (Demetrio Hernandez) made his big screen debut opposite Brad Pitt in the summer blockbuster World War Z. He discovered his love of acting at a young age, landing small parts in a variety of film and television projects, including several TV movies. One of his early roles was playing Drew McNeil on Grey's Anatomy. Dan and Caroline's daughter has just graduated high school, and they're ready to send her off to college and start focusing on themselves again. Molly's boyfriend, Junior, is graduating from his high school with top honors and has plans to go to Stanford, to the high pride of his parents. Everything seems like it is falling into place for all but unbeknownst to both of the families, Molly and Junior are about to become parents themselves. Once the teens break the big news, these two very different families are suddenly thrown together, which goes anything but smoothly. When I first read the logline for Welcome to the Family when NBC picked it up in May, I remember groaning. Really? A sitcom about the culture clash when a Hispanic and a Caucasian family are forced to meet? We're really doing sitcoms about this? In 2013? It seemed to invite all of the worst possible stereotypes, and I immediately braced myself for yet another sitcom that gets all of its "laughs" from cheap shock humor and "satirical" racism. Because one 2 Broke Girls just isn't enough, apparently. But when I watched the pilot, I was pleased that it subverted my expectations. The cheap humor I feared was almost completely absent, and most of the characters managed to resist the easy stereotypes the show could've easily pinned them as. If absolutely nothing else, Welcome to the Family wasn't the racist mess it easily could've been. Honestly, though...that's about the only nice thing I can say about it. It's not racist! Yay! But it's really boring, and feels kind of empty, which is strange for a show dealing with topics as potentially heavy as this one. I think it feels empty because the characters are so weak – in fact, they're hardly characters at all as much as they are stock personalities. Nothing about them feels natural – Mike O'Malley's character is an old-fashioned type, blue-collar dad, because of course he is. His wife is his level-headed and supportive companion, because that's what TV wives are supposed to be. His daughter is ditzy, and oh, she's also a raging feminist, because why not? That's a personality quirk that characters have sometimes. Why is she a feminist? Well, that would require some deep digging that Welcome to the Family doesn't seem capable of or even interested in doing. Junior and his family aren't much better – he's an Ivy Leauge-bound brainiac and his dad is a tough-minded macho man and his wife is his level-headed and supportive companion...hey, that sounds familiar, doesn't it? Everything here just feels so overly calculated, from the characters to the paint-by-numbers plot even to the painfully generic "quirky!" music cues that the show places in between scenes. The only thing that isn't calculated is the jokes – because there's none of them. I didn't laugh once, and I'd struggle to identify points where I was even supposed to be laughing. The show feels a little bit like a script that was supposed to get punched up by a writers' room, but never actually made it to that stage. True, lots of sitcom pilots have stock characters and generic plots, and most aren't very funny. But most sitcom pilots - the ones worth a damn, anyway – have at least a suggestion of a purpose, of something there beneath the surface. What makes me so unconfident that Welcome to the Family will overcome its issues and turn into anything worthwhile is the fact that it feels like there's nothing beneath its overly generic surface at all. The best thing I can say about this show is that it's not as terrible as I thought it'd be going in. Or at least, it's not the same kind of terrible I thought it'd be going in. If you're afraid this show is going to be the cloying racism-fest its premise suggests it might be, then you'll be relieved to know that it's not that at all. But it is really boring, with painfully generic stock characters and a premise it doesn't seem to know how to deal with. There's an interesting sitcom to be made about teen pregnancy, and even an interesting sitcom to be made out of the cultural identities that are occasionally hinted at here, but Welcome to the Family would rather just coast along in its blandness, never allowing itself to be anything more than a sitcom that's as safe and generic as they come. Discuss the show after you watch it on Thursday, Oct. 3, 2013 at 8:30PM ET/PT on our message board.